Description of "The Lost Treasure: Early Hindustani Talkies"
Ustad Jhande Khan and Wazir Khan. Includes more than 60 rare images of films and people from old magazines/newspapers. K Pasupuleti The author is a retired Technical Officer from the Defense Research and Development Laboratory, Hyderabad, India. He had the duties of Officer-in-Charge communications, Project Coordinator for installation of 800 line digital exchange, was responsible for providing special communication and satellite links for test flights of Prithvi and Agni missiles. On completion, was posted in Human resources department for training of technical, industrial personnel, conducting in house seminars and orientation programs. Prof S Singh Professor Surjit Singh, a diehard movie fanatic, period. He is a retired Theoretical Physicist. He has been watching Hindi movies since 1952, has been collecting Hindi songs, movies and magazines since 1969, and has been writing about these things since 1996. He has had a website since 1999, http://hindi-movies-songs.com/joomla/ He plans to publish many books on Hindi films and related material, mainly from the thirties and the forties. 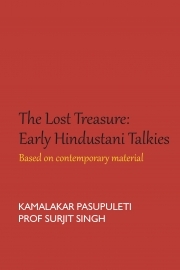 Reviews of "The Lost Treasure: Early Hindustani Talkies"
I think it is a great book. I have read it. The storyline is amazing. I suggest everyone buy this book. A book worth reading. To be a good writer, one should get writing assistance. To get more tips in writing.